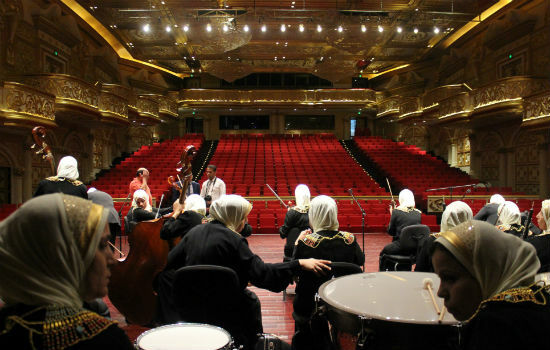 Over the last few years, I have had the privilege of spending a lot of time with Al Nour Wal Amal Chamber Orchestra, Egypt’s unique ensemble operating under the Al Nour Wal Amal Association and consisting of blind woman musicians. Over the years, what started as a purely journalistic relationship has turned into a journey of discovery, unveiling not only musical talent but extraordinary women too. Those who attend the orchestra’s concerts never fail to be moved by their art, their perseverance and passion. But closer interaction with those women opens the door to many humbling reflections. For as generous as they are in their music, the Al Nour Wal Amal also add to one’s life the many values that go beyond music. On this journey of interaction, they continuously manage to challenge and erase the many preconceptions that we create about blind people, women and the traditional communities from which they hail. In a word, spending time with them is in itself a learning experience, on the personal as well as the creative level. Al Nour Wal Amal Chamber Orchestra’s most recent journey — to Hong Kong and China — was one of those unique opportunities to get even closer to the woman musicians. It was the orchestra’s 31st international tour. And, although they had already performed in Asia — Thailand, Japan and India — this was their first time in Hong Kong and China. 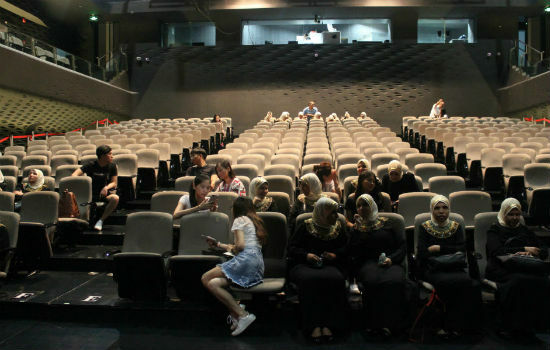 Conducted by Mohamed Saad Basha, the orchestra began their tour with Hong Kong (where they were invited by the AAAEA Egyptian Friendship Association), performing at the Hong Kong Community Hall on Wednesday 2 August. The repertoire included their standard classical selection: Rossini’s Overture to the Barber of Seville, Tchaikovsky’s Russian and Chinese Dance, Strauss’s The Blue Danube, the first movement from Mozart’s Symphony no. 40, Brahms’s Hungarian Dances no. 1 and 5, Saint-Saens’s Bacchanale, and Bizet’s Farandole from the Carmen Suite, among others. A touch of Egyptian flair was provided by Ahmed Abou Eleid’s composition By the Shore of the Nile, Mohamed Abdel Wahab’s The Mamluks (adapted by Ali Osman), and Rageh Dawoud’s Dance for Flute and Chamber Orchestra. In China (invited by the Chinese Ministry of Culture in the framework of the Chinese Egyptian cultural year), the musicians were welcomed at Zhuhai’s remarkable Mozart Concert Hall on 5 August. 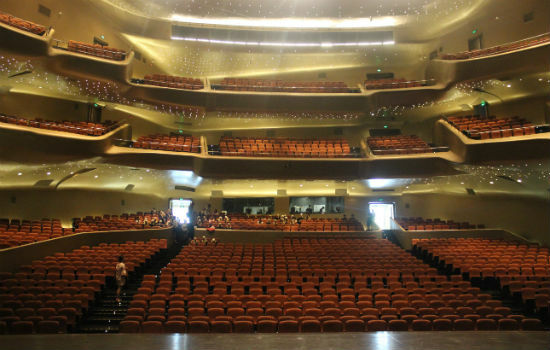 Part of the big cultural edifice known as the Zhuhai Huafa and CPAA Grand Theatre, the Mozart Hall is breathtaking with its postmodern golden walls and row of 11 balconies. The 10-metre high auditorium has over 800 seats in addition to 83 VIP seats and a tailor-made German pipe organ. To understand the weight of the hall and the Grand Theatre, it is enough to point to its programming: within weeks of the Al Nour Wal Amal concert, the Austrio-Hungarian Haydn Orchestra, the Rodney Marsalis Philadelphia Big Brass (America’s top brass musicians), the Danish National Vocal Ensemble, the Kyiv Classic Orchestra (Kiev, Ukraine) and a local ballet troupe performing Swan Lake were all included. From Zhuhai, the orchestra moved to Guangzhou, where it performed in the small hall of the famed Guangzhou Opera House, a remarkable edifice designed by the late Iraqi-British architect Zaha Hadid. The city’s pride, the opera is embraced by modern skyscrapers, while its design sits in harmony with the banks of Pearl (Canton) River which runs through the city. I can usually appreciate architecture only through the history of the walls spanning decades or centuries; modern buildings, let alone those erected in the 2000s, do not speak to me as much. But when I looked at Hadid’s edifice, inaugurated in 2010, I was enthralled, almost bewitched in a fairy tale sense, by the architecture as well as the culture and aesthetics it represents and enfolds. The placid curves of the off-white walls, sloping roofs and ceilings — as if imitating erosion by water, yet much softer, calmer and smoother — and large windows that allow sun rays to illuminate the lobby have, unlike any other building, touched my senses very deeply. The splendour of the edifice is only underscored by the artistic line-up for the season, which includes a concert by Berliner Philharmoniker conducted by Sir Simon Rattle, a recital by the famed tenor Jonas Kaufmann, internationally renowned Chinese pianist Lang Lang as well as concerts by German coloratura soprano Diana Damrau with her husband and French bass baritone Nicolas Testé, alongside a local Opera Aida production, among many other gems. “Magnificence” feels too simple a description of the emotions that this opera delivers. It was in such cultural surroundings that on 7 August, the Al Nour Wal Amal Chamber Orchestra conducted by Mohamed Saad Basha took the stage of the Guangzhou Opera House’s small hall, walking the audience through the compositions all the way to their well-deserved standing ovation. Such is the musical reality of this unique orchestra, which since their first international concert in Austria in 1988 has touched the hearts of audiences in many prestigious halls around the globe. Proud of their achievement, the musicians also feel a great responsibility and each of their concerts is preceded by a few weeks of intensive preparation in Egypt. Such was the case prior to their most recent travels when, guided by Mohamed Saad Basha, they put together a programme that also included “surprise compositions” representing the countries they were to visit. The media continuously follows the orchestra’s successes and travels, talks about their performances and music, and linking them to their visual impairment. It is often violinist Shaimaa who appears in the interviews as her eloquence and English skills stand out. A lot has been written about the musicians’ ability to overcome many obstacles, on the creative and social levels; since the challenges these women have to deal with are indeed many. Besides blindness, their personal roads lead through the traditional communities in which they were born; Western classical music is far from being part of their families’ daily bread. However, while we look at this orchestra through the prism of the obstacles they need to overcome, we must not forget that with each step, Al Nour Wal Amal’s abilities speak louder than their impairment. 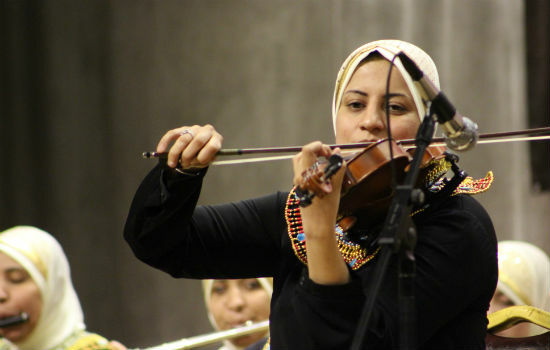 The Al Nour Wal Amal are not just a unique orchestra, “the fourth pyramid of Giza” or “a human miracle” as international media impressed by their performances have called them. They are not only artists dedicated to their craft and the music they play; they are also — or predominantly — wonderful human beings who turn every challenge into an opportunity. They are also girls enjoying their carefree youth, wives who take care of their households, mothers bringing up children with whose futures, education and well-being they are preoccupied. The women of Al Nour Wal Amal are also very generous when it comes to sharing their emotions, and anyone who approaches them with honesty will be offered the same in return. Unified by music and the conditions defined as complete or nearly complete vision loss, the musicians in fact represent a plethora of distinctive individual personalities. It is a vibrant collection of characters, each having its own unique colour. Together, and not surprisingly, their colours form exactly the same paintings, like the tableaux created by the sighted people. In the concert they direct all their energy into the music; beyond the stage they allow their dynamism and passion to take many different turns. Constantly eager to explore everything new, the women of Al Nour Wal Amal enjoy interaction with the surroundings and with one another. While relocating, whether in the airport, during sightseeing trips or while shopping, they move in groups of four: three blind musicians with one sighted supervisor. It takes some time for them to occupy their seats on the bus especially since each girl insists on sitting next to her close friend. The cacophony of chitchat, laughter and little quarrels about the places does not cease until Amal Fikry, Al Nour Wal Amal association’s vice president and the head of the orchestra, takes the microphone and with her hallmark ya banat, ya banat (Girls, girls) imposes silence. Depending on the situation, Fikry proceeds with her words of wisdom, gives advice, praises the girls’ performance, points to areas of improvement or introduces them to the day. Naturally, Fikry has a special status among the girls who love and respect her deeply. It is she who takes care of them as musicians, girls, mothers and wives, and acts as the main dynamo behind all their international travels. When the bus stops at a tourist destination, the musicians engage in one of their favourite activities: taking photographs. 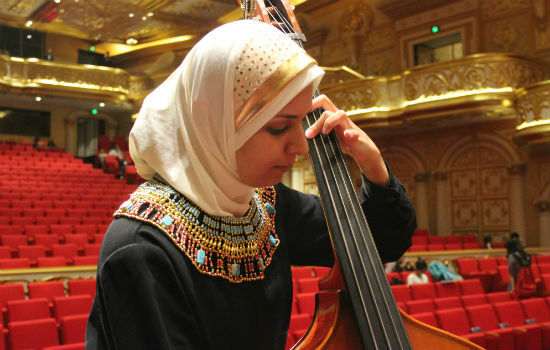 Many younger girls pose for the cameras and take selfies — which they cherish and share with their families and friends — yet it is cellist Fatma who, not without good reason, has been nicknamed “the model” of Al Nour Wal Amal. Fatma enjoys her particularly friendly and spontaneous relationship with the camera lens as she strikes many poses. On the bus, one is able to uncover several other distinct characteristics. While the older musicians might occasionally doze, the younger girls add a lot of life to the trip. The group asks violinist Maryam to sing. 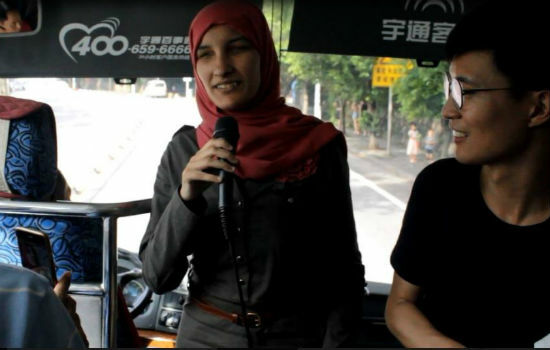 Her velvet timbre doesn’t take long to attract the attention of Amgad, as one of the volunteer Chinese guides and a student of Arabic language at Guangzhou University introduced himself to the group. Within a few minutes, Maryam and Amgad create a lovely duet of Dalida’s Helwa ya Baladi, for which they were fervently applauded by the whole group. Then Basma opens her violin case and starts accompanying the songs. In this showcase of talents, violinist Nahla responds to the girls’ request to recite her poetry. With her serious attitude, Nahla begins pronouncing simple rhymes about social issues, often mocking the burdens of life. Though the group has obviously listened to the verses several times, they still laugh at each creative pun pronounced by the young poet. But the atmosphere grows sombre when Nahla begins her poem dedicated to Ali Osman, Al Nour Wal Amal’s conductor and mentor who passed away in February 2017. Until recently Mohamed Saad Basha was in charge of the junior orchestra, while it was Osman who spent many years with the main-touring orchestra; in the musicians’ words he was not only their mentor but also a father figure who advised them on many personal issues. This trip was without Osman, and the wound of losing him is still very fresh. Nahla’s touching verses leave the musicians as well as the supervisors tearful. Back in the hotel, the older musicians retreat to their rooms for some well-deserved rest, while the adrenaline keeps running high in the younger ones’ veins. The most adventurous girls start exploring the hotel’s facilities and encourage the group to join them at the gym, where they take the treadmills and step machines to extremes. The musicians regroup during meals when they enjoy discussing the last concert, occasionally pointing to one another’s strengths and areas for improvement or simply engaging with the most mundane issues. Their remarks about food become a pretext to speak of their cooking skills. And this is how I find out about flautist Rasha’s culinary talent. I also learn of cellist Rania being a remarkable makeup artist, a skill she doesn’t mind demonstrating in the room. As the day ends, the wives and mothers would reminisce about their families and how they miss their husbands and children waiting for them in Cairo despite enjoying their travels. They talk of the little souvenirs they are bringing them. The chitchat has no end. When night falls, a few girls retain their energy, move to each other’s rooms, until they are reminded of the next day’s hectic schedule by the supervisors or by dawn peaking through the curtains. Despite the packed programme and three concerts, the travels bring a lot of joy to the orchestra. The musicians will tell you how those journeys have changed them on a personal level, adding to their understanding of cultural differences and enriching them with a sort of flexibility towards people, nations, cultures and traditions, something many of us still need to learn. And as they carry their music around the globe, they also leave many messages behind. Their tours speak of their art, perseverance, joy for life and boundless positivity. The Al Nour Wal Amal Chamber Orchestra are true cultural ambassadors, who apart from carrying art with them, also demonstrate that blindness is not a disability. On the contrary, their impairment seems to be an opportunity for a deeper and more humane look at life, an ability many of us, overtaken by our daily routines, lack. The women from Al Nour Wal Amal offer us the gift of music and culture, and invite us to reflect.